Wooden Garden Bridges add a unique accent to any yard. Place them over river rock to create an instant backyard stream. Handcrafted, these bridges come in a variety of woods, finishes and lengths. A standard twelve foot length is shown on the right. Standard lengths are 8`, 12` and 16`. There are many garden bridge styles to choose from. The “high rise” style bridge to the left accents this japanese style koi pond beautifully. 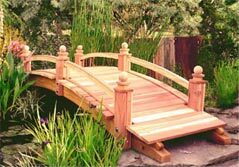 We look forward to helping you find the perfect bridge to suit your unique landscape style.